You have all been learning about my experiences growing up in the Catholic Church, which I wrote about in several previous posts. (Memories in the Church on the Hill. )The three of you were raised in that same religion, but as adults, you have now formed your own opinions regarding the Church. Over the years, I have experienced different religious services—as a guest at a few bar/bat mitzvahs, with a friend at an Episcopal service as well as Aunt El’s Episcopal wedding, and at the Methodist Church up the street with Kelly’s family. 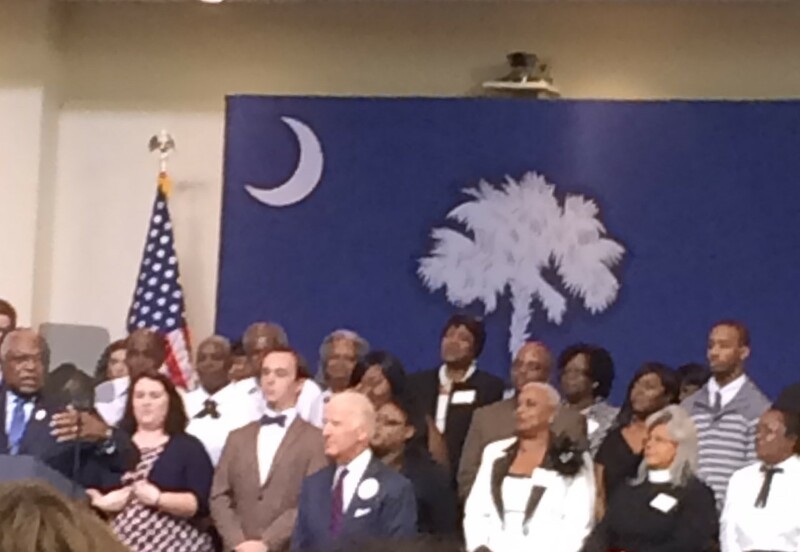 Yesterday, Dad and I added a new religious experience to our repertoire, at an AME Zion church, which was the site of a rally at which the keynote speaker was Casey’s favorite guy, Vice President Biden. Not paying attention to that fact that we would be going to a church, we dressed in jeans, and while that did not make a big difference to the other attendees, it did to me. Looking around at how nicely almost everyone else was dressed, I felt I was being a bit disrespectful, but we nevertheless did not let that deter us. It was several hours before the guest of honor arrived, but we were not at all bored. The music was fabulous. We heard a combination of blues/gospel/spiritual music sung by several choirs of men, women, and children. The energy was electrifying, and we found ourselves clapping, swaying to the tunes, and smiling. There was lots and lots of smiling. Many spoke—men and women, both politicians and members of the church. We were honored to have the first female bishop of that church as one of our speakers. The messages were all positive and encouraging, and we left feeling so uplifted. Looking around, we were clearly in the minority, but none of us in my group felt that way. Everyone was just so happy and welcoming. I wish there was more of that in this country. Going to church today is vastly different from my childhood, and from what I have read, 1964 was when a very large line was drawn in the sand between the old and new mass. That was the year priests turned and faced the congregation, and parts of the service were now recited in English. As a young child,I recall going to church and not understanding a word the priest said because it was all spoken in Latin. Mass began with the words: “In nómine Patris, et Fílii, et Spíritus Sancti”, which is translated as the familiar “In the name of the Father, and Son and Holy Spirit”. I remember the aroma of incense permeating every corner of our church. On one occasion, I announced to the congregation in my playground voice, “I smell carrots.” Hearing that, and imagining those words coming from a small child’s mouth, I laugh now and hope Grandma felt the same way. No one was permitted to receive communion without fasting. I believe that the early rule forbade all food for three hours, and no liquids, except water, for one hour prior to receiving communion. That was difficult and was probably the reason Grandma was able to get us all out the door so early. Get up, go to church, and hurry home to have breakfast. And those were the days before Saturday evening masses were allowed to fulfill your “Sunday obligation.” No one considered complaining. You just did it because those were the rules. As I recall, I would recite the commandments in my head, skipping over “thou shalt not commit adultery” and “thou shalt not covet thy neighbor’s wife” because, well, I didn’t comprehend the meaning of adultery and I had no wife. However, I did have parents to honor, but did I really know how many times I committed each crime? So I would decide on my list of sins to confess, and then add at least one more sin, “thou shalt not bear false witness against thy neighbor” (translation: don’t lie) to compensate for not really knowing how many categories of sins I committed. One final thought about religion did not occur in church, but is definitely church-related. Every day at school, either before or after the Pledge of Allegiance, we would all recite “The Lord’s Prayer.” My interpretation was that God’s name was Harold (“Harold be thy name”), and someone was taking us all to Penn Station (“lead us not into Penn Station”). I am confident that I was not alone with those beliefs. I was just taught to memorize the prayer but never given an explanation. Certain things you just accepted and never questioned. You could always tell who in the class was Catholic and who was not, because the Catholic children would always stop short of reciting the prayer at “deliver us from evil”, while the rest would continue with “and thine is the kingdom, the power, and the glory, forever and ever. Amen.” I was always confused, but that was how it was taught to us. Several years ago the Catholic Church finally decided to join the parade and now recites the little thing at the end like everyone else. In 1962, just after the end of second grade, prayer in public school ended. I am not pointing this out to begin a political discussion or a discourse on the Constitution, because I only want to give you all a window into what life was back when I was young. No debates, please. Church was just different. 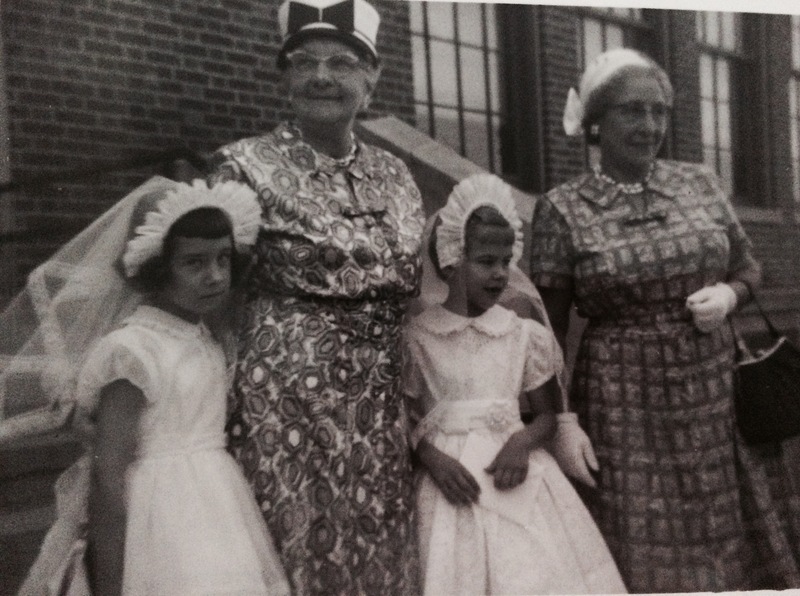 Karen and Maureen with grandmothers after first communion- 1962.